The Bullock Webster collection has been updated. Click the link above for more information. The Bullock Webster collection has been updated with new high-quality images. 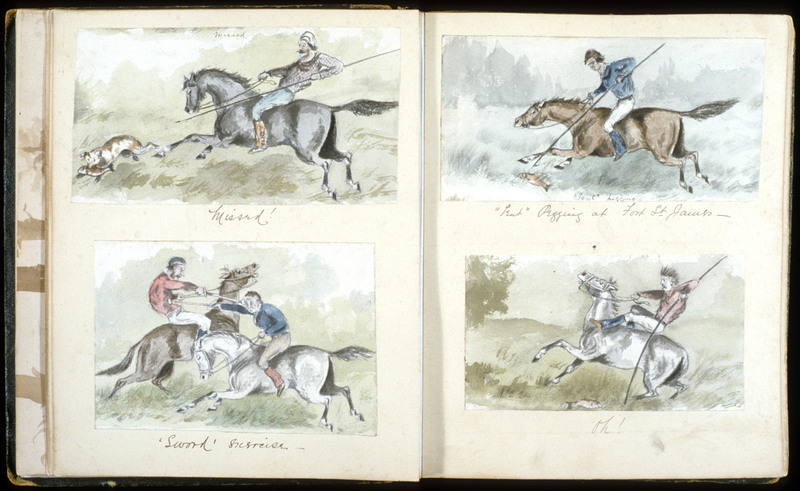 The original material, an album filled with watercolour and ink sketches, is very delicate. As such, the digital collection up until now was composed of scans we made of the old access photographs. Although we tried to make these scans represent the original sketches as accurately as possible, there were limits to how accurate they could be. However, we recently re-photographed the original sketches, and the collection is now composed of these new high-quality digital photographs. As you can see from the images below, the new images represent the original sketches much more accurately. Scan of old access photo. A page-by-page digital copy of the original album can be found here. 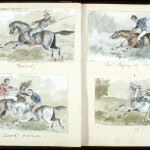 The individual images may be reached through links on the appropriate pages of the album. To access the links, scroll down to the field marked “Individual Images”. (Note: no links appear under the front and back covers of the album.) 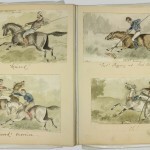 The individual images can also be found by browsing the collection. 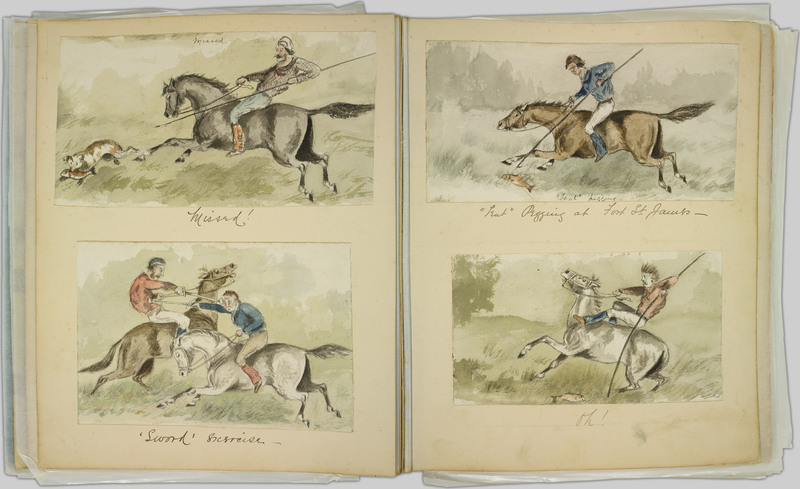 This image is from the Augustus Pemberton collection, one of two collections donated to Rare Books and Special Collections by John Keenlyside in 2008. We are currently digitizing both collections, and they should appear on the Rare Books and Special Collections website in the near future. 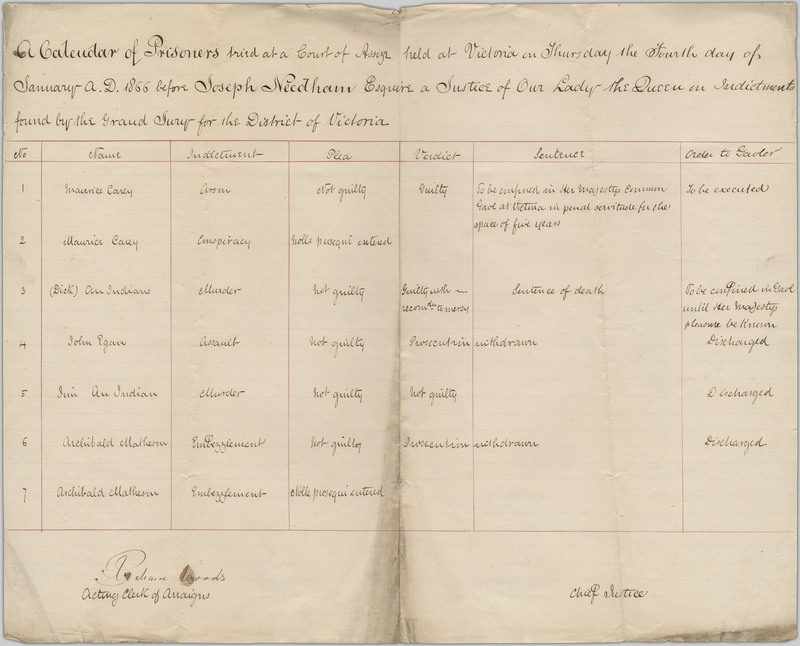 The image is of a calendar of prisoners who were tried at the Court of Assize in Victoria on January 4th, 1866. Of the five prisoners tried, three were discharged, one was sentenced to death, and one was sentenced to “penal servitude” for five years. There are a number of interesting things in this picture. Two of the prisoners do not have last names written on the calendar, and instead have “An Indian” written after their first names. In one case the first name is in brackets, while “An Indian” is not. 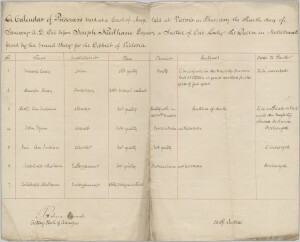 It is also worth noting that one prisoner, who was sentenced to death by the court, was ordered to be kept in jail (spelled “Gaol” on the calendar) until “Her Majesty’s pleasure be known”. There is also a double entendre in the calendar. In the case of the first prisoner, who was been sentenced to death, the order to the jailor (“Gaoler”) reads “To be executed”. We assume this means that the jailor is to carry out the sentence, not that the jailor is to execute the prisoner. 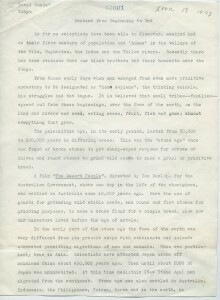 One of our current projects is to digitize the David Conde fonds in partnership with the University of Tokyo. We are discovering first hand that David Conde was a hugely prolific journalist who had much to say about a lot of subjects. As such, the David Conde fonds contains vast quantities of manuscripts for books and articles. Though he mostly wrote about Japanese and American politics and culture, he would sometimes venture into other subject areas as well. 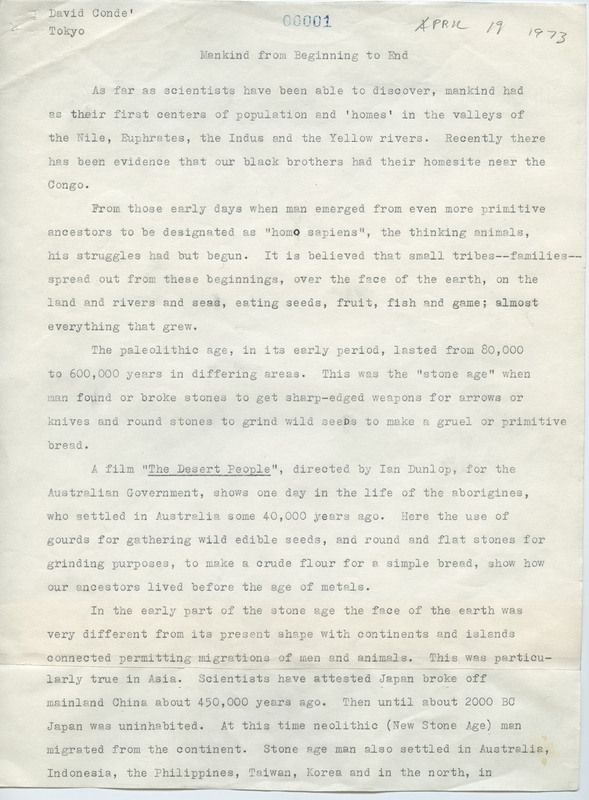 This page (click the image to enlarge) is the first page of an article about historical anthropology entitled “Mankind from Beginning to End”. With a title like that, this article is a fitting example of how prolific David Conde was. We are half expecting to find an article called “Everything under the Sun”, or maybe even “The Kitchen Sink”! For more information on the David Conde fonds, click here. To see our previous blog posts about the David Conde fond, click here and here.